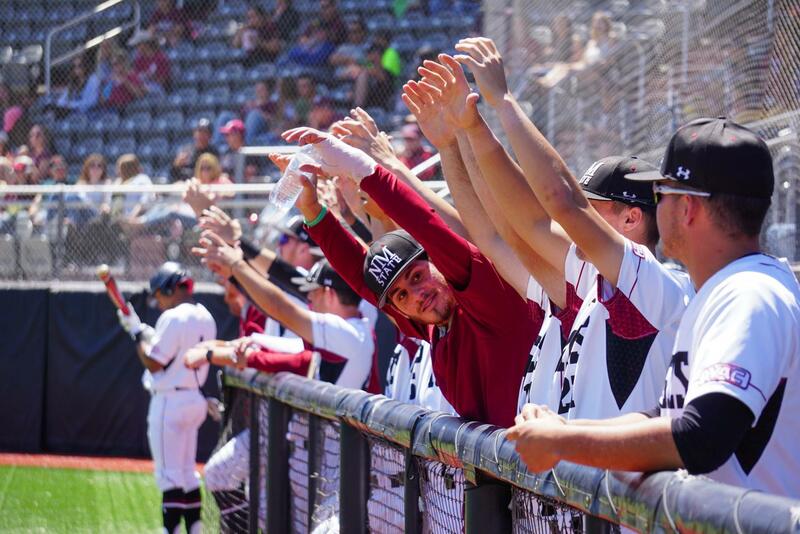 The New Mexico State Baseball team celebrates after one of their comrades achieves a base hit; the team has an overall record of 27-14 and 11-4 in the WAC. 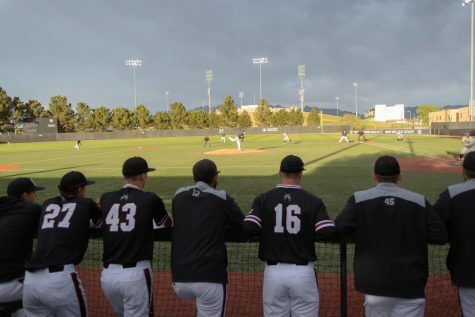 It is important for collegiate teams to be playing their best baseball come late April and into May; possibly setting themselves up to play in the NCAA tournament and into June. 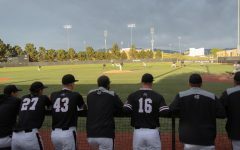 The New Mexico State baseball team is doing just that and has won 11 of its last 12 games, giving them a current 11-2 record through the month of April. More importantly the Aggies (27-14 overall) are 11-4 in the Western Athletic Conference and as of right now rank third, only behind Grand Canyon (10-2, first in the WAC) and Sacramento State (9-3, second in the WAC). 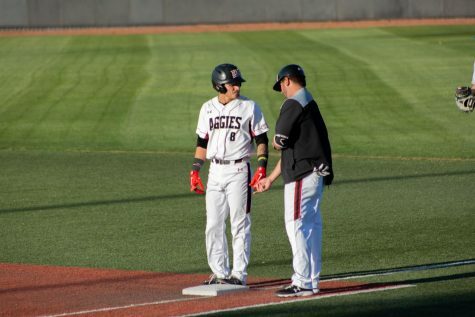 Coincidently the Aggies and ‘Lopes are set to battle it out this weekend for a three-game series and NMSU head coach Brian Green’s squad could potentially rise up one or two spots depending on how this weekend goes. The team has been in Arizona since Tuesday, as they also played PAC-12 team Arizona State and defeated the Sun Devils 8-7 on Wednesday night in Tempe, Arizona; a signature win for coach Green and his staff. Plain and simple NMSU is rolling and it doesn’t look like it’s going to slow up, with just two more conference series remaining after this weekend’s slate and including a non-conference series with Gonzaga and two games against the University of New Mexico also remaining. 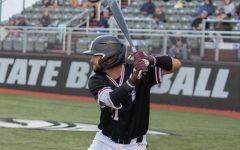 This robust streak and turning point may be accredited to the team’s series loss to Sacramento State, which came weeks ago at the end of March. Since those back-to-back losses against the Hornets, Green’s team has produced a championship style of play, even putting up a dog fight against nationally ranked No. 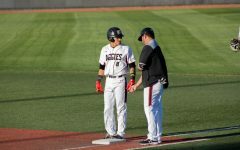 3 Texas Tech at the beginning of April only losing 2-1; that neutral site game was the start of it all, the Aggies then went on an eight-game win streak before losing to Northern Colorado, a series they still won. The WAC regular season title is up for grabs right now, and NMSU controls its own destiny. The obvious is that anything can happen in the sport of baseball, but the conference’s top four teams are all closely packed. With Seattle U (8-4, fourth in the WAC) being added with the top three conference teams already mentioned. 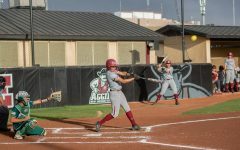 The rest of the conference is sitting at five or less wins each, also keep in mind that only six of the nine teams will make the double-elimination WAC tournament. The site of the tournament will remain in Mesa, Arizona for the fifth straight season as the teams will play in the renovated Hohokam Stadium, preseason home of the Oakland Athletics. Last year NMSU entered the tournament as the No. 1 seed but had a quick two and done postseason. Sac. State was crowned as last year’s WAC tournament champs, winning the tournament as the No. 3 seed and earning the WAC’s automatic bid to the 2017 NCAA Tournament. NMSU leads the conference in numerous categories, especially on the offensive side. To name a few categories that the Aggies rank first in are batting average (.327), hits (460), runs scored (375), slugging percentage (.502) and home runs (40). 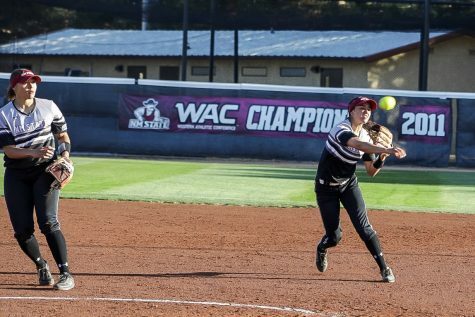 On the defensive side, the Aggies still rank high in multiple categories including important ones such as fielding percentage (.977) where they are only behind foe and upcoming opponent GCU (.978); NMSU also ranks second in earned run average (4.34) only behind Sac. State (3.83), whose pitching was just dominant during the second and third game of their series against the Aggies. 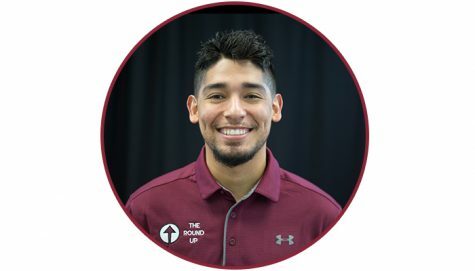 Coach Green and his up and rising team are ready to prove themselves in the month of May. Green’s “respect the game” mantra shows the humbleness and pride of his team and should carry them far into the postseason when that time comes– expect them to finish on a high note and to turn some heads while doing so.